By default, SharePoint uses the name of the server as the root URL address. 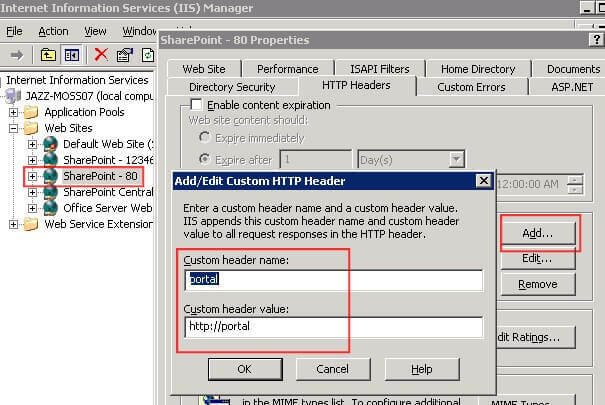 For example, if the server host name is 'usweb1019', your SharePoint URL address will start with 'http://usweb1019/xxxxxx'. I'd like to use a friendly name. Even still if we have to migrate or upgrade to new hardware, I would like the URL to the main site to stay the same. Add a CNAME in DNS. Add the new path to your Excel Services list of trusted paths. Change the Public URL of the Virtual Directory in Alternate Access Mappings. Install the SharePoint Administrative Toolkit and run 'updatealert' from the stsadm utility. Delete your crawled content in Search settings and start a new full search crawl. Now for the step-by-step instructions. In this example, we will change the URL path users will use to "http://portal". You can use anything you like. The hostname of the SharePoint server is 'jazz-moss07'. The desired host header name is 'portal'. 1) Add a CNAME DNS entry to your current SharePoint root. (You may need your DNS system administrator to do this for you.) You can also (optionally) map to the IP address instead of the hostname of the server. 2) In IIS on the SharePoint server, find the virtual directory that maps to the main SharePoint site (not the Central Admin or SSP sites). If you kept the default options it will say "SharePoint - 80". Right click on the virtual directory and select "Properties". In the "HTTP Headers" (tab), click "Add". Enter the desired header name that was used in the DNS setup (Step #1). 4) Change the Public URL of the Virtual Directory in Alternate Access Mappings. 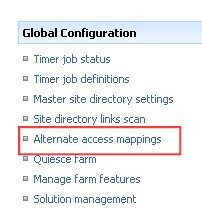 Under "Global Configuration", click "Alternate access mappings". Note the existing entries. Take a shot and/or write down the existing entries in case you have to reverse the procedure. Click "Edit Public URLs". Make sure the "Alternate Access Mapping Collection" is pointed to your content Virtual Directory. Change the "Default" to the new Host Header name. 5) Reset the web server. (From the command line on the SharePoint server, type "IISRESET" and press enter. 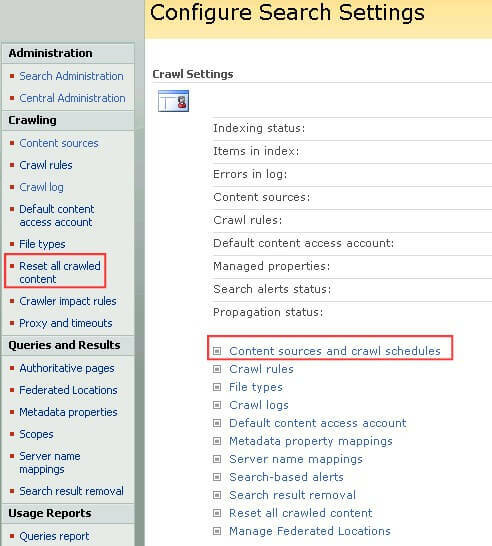 7) Delete your crawled content and start a new full search crawl. Back in SharePoint Central Administration, Shared Services. Under the "Search" section, click "Search settings". Under "Crawling" in the left navigation area, click "Reset all crawled content". 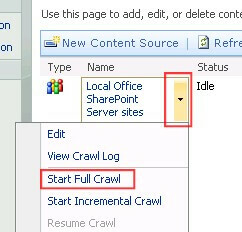 Then click "Content sources and crawl scheduled"
Hold the mouse over "Local Office SharePoint Server sites" until you see the dropdown arrow. Click on the arrow, then select "Start Full Crawl". 8) Test the new host header URL and all server functions. NOTE: If for some reason, you need to revert back to the way it was, the critical steps would be to reverse the entries made in Step #4 and Step #6 above, then follow the procedure in Step #7 for resetting and starting the crawl again.